Marc Raibert (born December 22, 1949) is a former Carnegie Mellon University and MIT professor who founded the CMU Leg Lab in 1980, moved it to MIT in 1986, and continued to direct it through 1995. He founded Boston Dynamics, a simulation and robotics company in 1992. Raibert developed the first self-balancing hopping robots, a significant step forward in robotics. Raibert earned a BSEE from Northeastern University in 1973 and a Ph.D from MIT in 1977. His dissertation is entitled "Motor control and learning by the state space model". Raibert's dream is to advance bipedal and quadrupedal robotics to a supernatural state. Boston Dynamics was acquired by Google in December 2013. 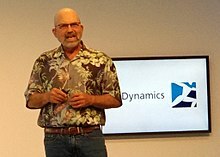 On the acquisition, Raibert commented that he was "excited by Andy Rubin and Google’s ability to think very, very big... with the resources to make it happen." In March 2016, Google began offering Boston Dynamics for sale. The company was acquired by SoftBank in June 2017. Several of the MIT Leg Lab robots appear in the movie Rising Sun. Raibert was a keynote speaker at the 2016 Congress of Future Science and Technology Leaders. On May 11, 2018 Marc Raibert took part in TechCrunch Sessions: Robotics 2018 where he spoke about the SpotMini robot that Boston Dynamics will begin to sell in 2019. BigDog, a self-balancing four-legged pony-sized robot from Boston Dynamics. ^ Raibert, Marc (1986). Legged Robots that Balance. MIT Press. ISBN 0-262-68119-6. ^ "Boston Dynamics". Retrieved 2007-06-30. ^ "Marc Raibert: What's New Since BigDog? (IROS 2013 Keynote)". IEEE Spectrum: Technology, Engineering, and Science News. ^ Markoff, John (14 December 2013). "Google Adds to Its Menagerie of Robots". The New York Times. ^ Stone, Brad; Clark, Jack. "Google Puts Boston Dynamics Up for Sale in Robotics Retreat". Bloomberg.com. ^ Lunden, Ingrid. "SoftBank is buying robotics firms Boston Dynamics and Schaft from Alphabet | TechCrunch". TechCrunch.